Our Swing Gates can be supplied as commercial or residential gates for an automated or manual product, but otherwise will be designed specifically with your security needs in mind. We can offer standard, proven to be secure designs, or custom-build you a bespoke system to match specific requirements, or even match another gate originally installed/manufactured by someone else. 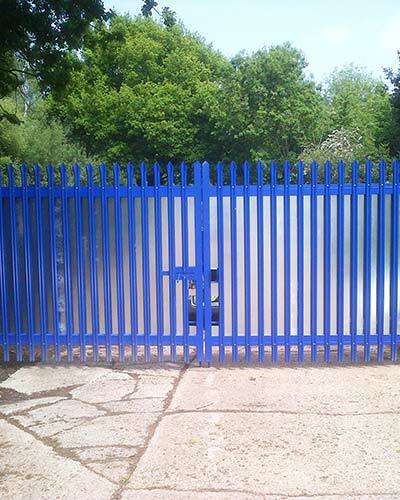 We can manufacture and install matching turnstiles/pedestrian gates for safe access. As an alternative to our extremely popular Cantilever Gates, Frontline Automation also offer Swing Gates to provide a high degree of security to all commercial premises. Swing Gates can be provided as either manual or fully automated. We fully design and manufacture all Steel Swing Gates in-house, meaning we can produce both traditional and contemporary designs to match the specific requirements of your site. There are a wide range of both hydraulic and electro-mechanical operators and associated controls available which ensures we can always come up with the perfect solution to meet your particular need. Swing gates act as the ultimate deterrent to uninvited visitors with a variety of security features available, such as Anti climb infill wire mesh, Rotating Anti-Climb, Saw Tooth and Barbed Wire. As with all of our automated gates, we design, manufactre and install matching pedestrian gates and turnstiles to allow easy and safe access for pedestrians. Please contact us to discuss your security and safety requirements. A site visit can be arranged free of charge to discuss your needs in more detail and for us to survey the premises.